Making correct decisions often requires analyzing large volumes of textual information. Researchers, analysts, magazine editors, venture capitalists, lawyers, help desk specialists, and even students are faced by various text analysis tasks. Huge piles of information accumulate in numerous text repositories held at news agencies, libraries, corporations, individual PCs, and the Web. The amount of stored information proliferates at a disastrous rate, and the human eyes and brain are increasingly unable to meet the challenges of this growth. Mankind is searching for intelligent electronic assistants to help with text analysis projects. 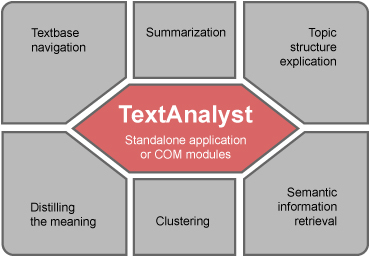 These and many other tasks can be successfully tackled by TextAnalyst, a unique software tool for semantic analysis, navigation, and search of unstructured texts. TextAnalyst will help you quickly summarize, efficiently navigate, and cluster documents in your textbase. TextAnalyst can provide you with the ability to perform semantic information retrieval or focus your text exploration around a certain subject. A synergy of unique linguistic and neural network technologies implemented in TextAnalyst ensures high speed and accuracy in the analysis of unstructured texts. Distilling the meaning of a text - formation and export of an accurate Semantic Network of the text or textbase. This network concisely represents the meaning of a text and serves as a basis for all further analysis. Accurate summarization of texts - the quality of the summary is provided by a balanced combination of linguistic and neural network investigation methods. The size of the summary is controlled through the semantic weight threshold. Subject-focused text exploration - user-specified dictionaries of excluded and included words allow the investigation to focus on a chosen subject. Efficient navigation through a textbase - the knowledge base can be navigated with hyperlinks from concepts in the Semantic Network to sentences in the documents that contain the considered combination of concepts. Individual sentences are in turn hyperlinked to those places in original texts where they have been encountered. Explication of the text theme structure - a tree-like topic structure representing the semantics of the investigated texts is automatically developed. The more important subjects are placed closer to the root of a tree. Clustering of texts - breaking links representing weak relations in the original Semantic Network enables clustering of the textbase. Semantic information retrieval - natural language queries are analyzed for semantically important words and all relevant sentences from the textbase documents are retrieved. In addition, a subtree of concepts related to the query is formed, which facilitates a simple search refinement. A Semantic Network is a set of the most important concepts from the text and the relations between these concepts weighted by their relative importance.